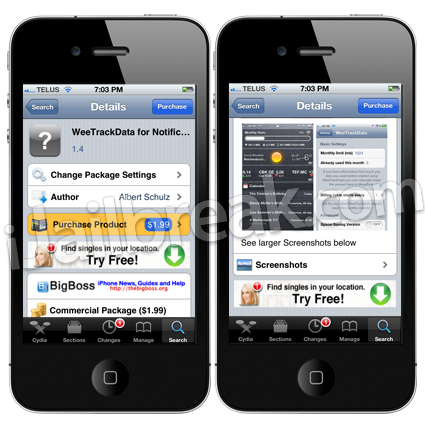 If you are looking for an easy, and more importantly quick way to check your data consumption on your iPhone or iPad 3G then you should check out the WeeTrackData Cydia tweak. The WeeTrackData Cydia tweak will allow you to easily track how much data you have consumed on a monthly, weekly or daily scale right from the Notification Center. This will allow those with limited data plans to ensure they are not going through their data too fast to the point that where they will run out before the month is over. it would be nice to grab it and yet but it is not free. Seriously? It’s two bucks…. Should everything that you want be free? Seem to track both carrier & data usesge which make it kinda useless. Save your $2 and get a coffee instead. Like others have said, this app tracks both the carrier and wi-fi usage, so what’s the point?